Growing up, my idol was Thomas Jefferson. As one of the founding fathers, he was a giant in US history. History books aimed at children described all of his great achievements, including authoring the Declaration of Independence; founding the University of Virginia; as President, sponsoring the Lewis and Clark expedition and purchasing Louisiana territory; and his role in the Revolution. He was one of the pillars upon which this country was founded. Further, he was an amateur scientist and inventor, a man who was always investigating the natural world around him and who probed the secrets of that world. He was a renaissance man, a man who could achieve anything he set his mind to, a true American genius. That was in the children’s books, and, of course, it is all true. However, there are many aspects of Jefferson’s life that didn’t make it into those books, actions and words that reveal that Jefferson was all too human. Even setting aside his relations with Sally Hemming, there were such flaws in his character that demonstrate he could be the pettiest of men. He was a man nearly defined by contradiction. Writing that “all men are created equal,” he nevertheless never freed the vast majority of his slaves, some 130 being sold upon his death to help settle his debts. And, speaking of those debts, while he railed against the Federal government’s spending, he himself never took account of his own, racking up mountains of personal debt that he could only sustain by taking out loans. He advocated small government and attacked his rival — and friend — John Adams for excessive use of executive power, but then, in an even bigger expansion of that power, purchased the Louisiana territory. However, the most disappointing thing that I’ve learned, for one who so idolized him as a boy, is his shear pettiness and vindictiveness. Jefferson, while never publicly attacking any rival, supported many newspaper men in their slanderous attacks of enemies, even those who had been dear friends at one time, such as Adams. The words he had these newspapers print on his behalf were vicious and vile, at a level that almost makes our current politics seem cordial. But, when confronted, Jefferson always deflecting the blame onto others, never taking any responsibility for his own actions. Jefferson even directly undermined the administration of Adams while serving as his Vice President. While there is still so much to admire about Jefferson, especially the mind behind all of the powerful words that form the foundation of our country, the man’s actions certainly do not live up to those words. As I read more and more about Jefferson and the Revolutionary era, the more I am dismayed by the man my idol really was. I don’t know if there is any real lesson to take from this, except that there are no perfect people out there; even the best of us are flawed. In an era where idols are now athletes and actors, who continuously show us that they are no more deserving of that respect than anyone else, it is both unsettling and liberating at the same time to realize that even those who we’ve put on the highest possible of pedestals were human, just like us. 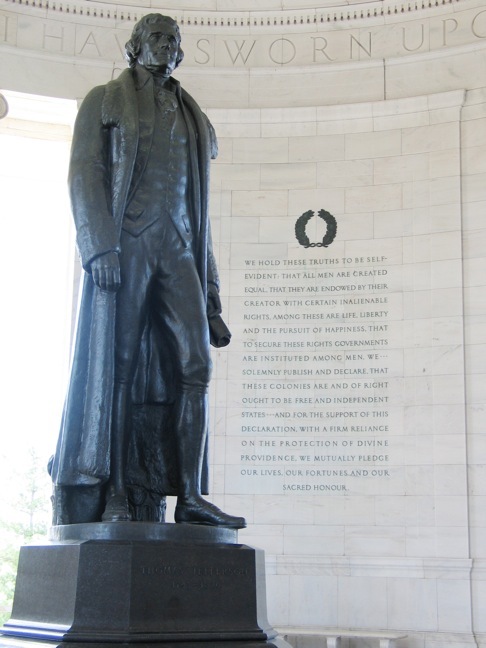 Maybe it is even more amazing what men like Jefferson accomplished, in spite of their imperfections.